If you have a blog, a website, or you are an affiliate marketer and you have ever searched for cheap SEO services or cheap backlinks, there is a very good chance that you came across SEOClerks.com, just like I did about two years ago years ago. If you did find SEOClerks and you knew nothing about the site at all, you might, quite naturally, want to know more about it before you spent any money on SEO services, or you offered your own SEO services for sale on the platform. So, for all those who know nothing at all about SEOClerks, here is an honest, no holds barred, review of SEOClerks.com, the site by Iconicware that says it offers thousands of SEO freelancers, thousands of SEO experts and thousands of SEO Services. SEOClerks.com is a platform that connects freelance suppliers of SEO services to buyers who are looking for a cost effective way to promote their websites. SEOClerks.com is similar to micro-job sites like Fiverr.com in the way that it operates, but unlike sites like Fiverr on which you will find thousands of different types of services, SEOClerks is totally focused on SEO and web marketing related services including backlink building, on and of page SEO services, content writing, and social media services. When a buyer purchases a service and that service is completed, SEOClerks deduct a small commission from the sale value and the net figure is made available to the seller. The buyer’s money is not released to the seller until the order has been completed, which provides a safeguard against non-delivery of a service. I can, with my hand on my heart, tell you categorically that SEOClerks.com is not a scam. I have been both buying and selling in the platform for over two years and I have never had any problem withdrawing my money, whenever I want to, and I have never had any serious problems with any of the services that I have used. I have paid for services that were not as good as I had hoped for, but I have never been totally scammed. That, I believe, is a testament to how well SEOClerks is run. While they do not vet services that offered on the site, they will take action if a seller breaks the rules or is reported for consistently not delivering what they have advertised. From a buyer’s perspective; I would say that you get what you pay for with SEOClerks, just as you would with any website. If you were to pay $1 for a link pyramid, for example, you can’t reasonably expect to get your website boosted to the number one spot on Google overnight. To buy SEO services from freelancers on SEOClerks, you will first need to register, but that only takes a couple of minutes. You can then add some funds to your account with SEOClerks, by credit card, debit card or PayPal or, if you prefer, you can make the payment when you actually place an order. The site is very well laid out and services are neatly categorised into SEO service type. When you first log in, you will see the home page, which will be displaying some of the most popular services and the “featured services” will be at the top of the page. 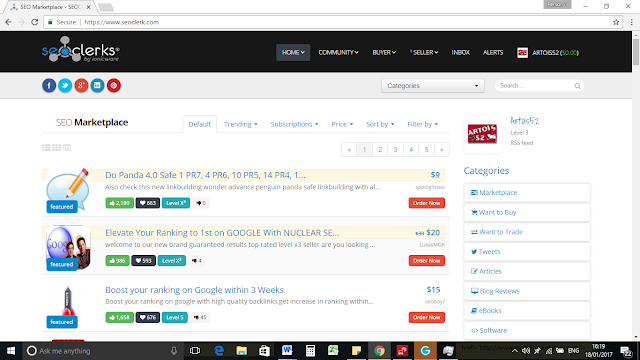 The featured services are at the top of the home page because the sellers have paid a fee to get them there. That’s not a criticism, by any means, but it is worth checking out some of the thousands of other services that are available on SEOClerks as well as just the front page featured ones. The services that are offered on SEOClerks are not vetted by the owners of the site in any way, so the best way to judge the authenticity of claims made by sellers is to check the buyer’s reviews and also to check how long the service has been advertised on SEOClerks. I would recommend that you use a bit of common sense too. As I said earlier, if you pay $1 for ten thousand backlinks, you can expect those backlinks to be spammy, at best, and, at the worst, to negatively affect the ranking of your website. The other way to find the best SEO services on SEOClerks, of course, is to check our reviews of some of the best SEO and backlink services on SEOclerks! If you have ever used a site like Fiverr.com, you will find the selling services on SEOClerks works in a very similar fashion. I used to sell services of on Fiverr.com, but I have genuinely had a lot more success on SEOclerks and I have found it much easier to use and a lot more flexible. Once you have progressed from a Level 1 Seller, you can set prices for your services at whatever level you want to you, you can add optional extras, and you can create coupon codes for special offers and discounts. As you progress through the seller levels, you get various other benefits, such as the ability to offer instant download services and subscription services, you can withdraw money more frequently, the minimum withdraw amount reduces and, at the higher levels, you earn a higher percentage of your sales too. The basic Level 1 restrictions, which all sellers start with, are not all that onerous. The price of a service offered must be between a minimum of $5 and a maximum of $125, the minimum amount for a withdrawal is $15 and, although withdrawals will usually hit your PayPal account within a few minutes. As a new seller, there might be a delay while your withdrawal is reviewed, although I don’t remember ever having experienced that. So, to conclude my review of SEOClerks.com, if you are looking for cheap SEO services, backlinks for your websites or other web marketing services, I can honestly recommend SEOClerks. The only downside to SEOClerks, from a buyers perspective, is that choosing the best SEO services from the huge number of different services that are offered on the site can be tie consuming, which is why I began to develop this site so that I could share some of the of the services that I have found to be good with other people and save buyers some time. I’m not doing this totally out of the goodness of my heart, of course, because SEOClerks also has a pretty good affiliate programme too! SEOClerks has been around since 2011, and it is a thriving marketplace for freelance SEO services. If you do decide to buy backlinks or other SEO services from SEOClerks, your money is safe until you the work is completed, so it gives you that extra level of comfort instead of paying for services up front. As a seller, I have only had one single buyer who, in my opinion, gave a negative review of my service unfairly, but that is no fault of SEOClerks. Other than that, I have found everyone I have dealt with on SEOClerks to be genuine, appreciative people and I give SEOClerks a five star rating, without any hesitation at all.